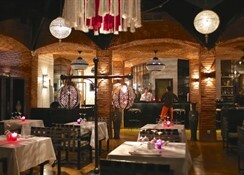 Adama Resort is an impressive resort nestled in Marrakesh. Offering views of the Atlas Mountains, this resort complex features 57 villas set amidst lush gardens and an Andalusian reflexion pool. 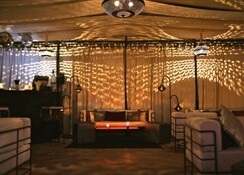 The resort is an amalgamation of Moroccan architectural, Moorish traditions and modern technology. The spacious villas come with their own kitchenettes, a fridge and luxurious bathrooms. Amenities and facilities at the resort include an inviting pool, a relaxing spa offering various massages and therapies, several lounge areas, and restaurants serving scrumptious meals. For families travelling with children and babies, there’s a kid’s club as well as babysitting service. Located in a remote part of Marrakesh, the Adama Resort offers some of the best views of the Atlas Mountains. The establishment provides a free daily shuttle service that takes guests into the town. Next to the resort is the Argan Golf Resort, which houses an 18-hole course and a 9-hole course. The Menara International Airport is about 8km from the property. The 57 villas at the Adama Resort are set around a central pool. 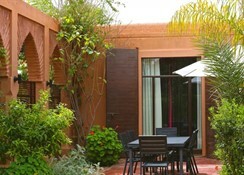 The villas carry Moroccan, Moorish as well as modern influences. The villas are categorised as Borjs, The Menzehs, The Fnenes and The Riads. The amenities included in the accommodation are free Wi-Fi, safe deposit box, satellite TVs, a fully equipped kitchen with electric hob, microwave, fridge, and en-suite bathrooms with hairdryer and toiletries. The villas are ample outdoor spaces, while being private from each other. At the Adama Resort, there’s only one restaurant serving international and local cuisine. The kitchenettes in the villas enable guests to cook their own meals. 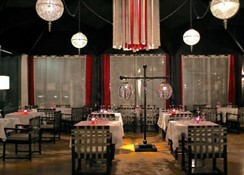 The restaurant serves a buffet breakfast from 7:30am to 10:30am. Lunch and dinner are a la carte. There’s also a snack bar serving finger food by the pool. 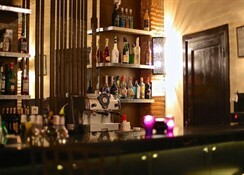 The Lounge Bar serves a variety of tapas and aperitifs. The establishment offers in-room service enabling guests can enjoy their meals in the comfort of their rooms or out on the terrace. The resort features an amazing wellness area, which houses the spa that offers a variety of massages, therapies and a traditional hammam. The Andalusian pool allows you to relax under the balmy sun. The resort offers exclusive golf packages through which guests can discover various golf courses in Marrakesh. 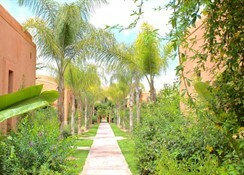 The resort also organises day trips to Marrakesh’s monuments, the city and its gardens. You can also experience the city’s vibrant nightlife thanks to the amazing concierge service that the establishment provides. Feel like explore the natural side of Morocco? Adama Resorts has you covered here as well. One-day excursions to places like Ourika Valley, Imlil, Essaouira, Ouzoud Waterfalls, Zagora, Ouarzazate, Walidia and Merzouga are organised by the resort. Brilliant place to stay good entertainment.pool is good as well the only downside is it is little bit outside of main centre but if you have a car then no problem and they have free bus to centre but you have to maintain the time.good housekeeping as well and the staff are very friendly.